During the next few days we will be excited to finally open our new Technology Support Center (TSC) at Lake Superior College (LSC). The construction and remodeling have taken much longer than anticipated so several of us are anxious to begin serving students in the new space. Apparently not everyone shares our enthusiasm. One anonymous college employee has criticized the use of the special I.T. dollars for this project. In particular, this was the second year that each MnSCU campus received additional dollars from the system specifically dedicated for use with local (campus-based) I.T. projects. We call it the “I.T. Special Allocation” although there is probably a more official name for this initiative that I just don’t know about. The employee stated that using the special allocation for this project was an improper use of funds. I actually can’t say for sure one way or the other, but my interpretation is that we have acted properly. The guidance for the use of these funds comes from a MnSCU memo dated August 8, 2007 with the following subject line: “Guidance on College/University Spending of FY 08 IT Allocation.” The same guidance was used for the FY09 funding as far as I know. A new, flexible technology architecture will enable innovation and preserve the ability of individual institutions to systematically customize and enhance core, systemwide applications while implementing identified best business practices and preserving data integrity and systemwide business/academic seamless operations. A modular architecture will allow us to realize the benefits of economies of scale while still allowing for institutional variation within an interoperable technology framework. Investments in our online learning and electronic student services will allow us to keep pace with increasing demand while also expanding access and opportunities for the growing pool of non-traditional learners. Enhancing online functions will go beyond learning and include online career planning, disability services, advising and business functions. Around-the-clock help and support for accessing the new online services will also be provided. Ignoring the incredible corporate-speak for the moment, I believe that these two categories justify the spending of the dollars on this project at LSC. A little background is probably in order. We opened a new building in August 2007 and in that building is the current Student Technology Center (STC). 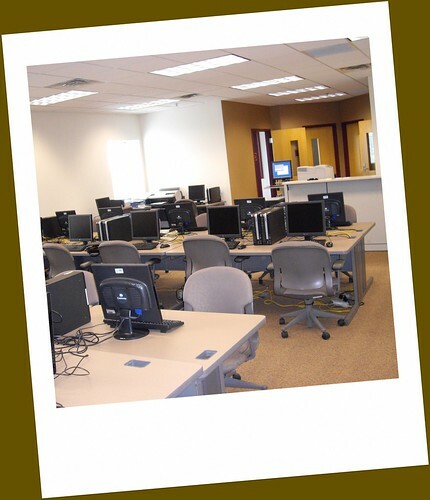 The STC is an open lab where students can go to get technology help or just to use a computer as needed. There are about 55 computers in the lab. At the time that we opened the lab we heard student complaints (via Student Senate) that the lab was too small and that students had lost open computing space on campus. At the same time we had another space that had been used for several years and was known as our e-Campus which was also the help desk for online students. In other words, there were two help desks, one for on-ground students and one for online students. Part of the plan that we made to address the Student Senate concerns was to continue to have two open computing labs on campus but only one help desk – sort of a one-stop shop for student help needs with technology. Thus we decided to expand and remodel the small e-Campus space into the adjoining much larger space. That new space is the STC that we are ready to occupy. The other space will be converted into a quiet computing lab – in other words, no help desk services will be available there. Overall, we are attempting to meet the identified student need for more access to technology infrastructure and we believe that we will provide better service to students including our online students. It’s not much to look at just yet, but in a few weeks it should be a busy hub of activity on campus. Thanks for the explanation and description, Barry. Your students will definitely enjoy having this modern computing space for their study. We have similar facilities on our campuses at the University of Southern California and they are very popular with the students. Am I brain dead or is there a typo in this sentence: “The document goes on to define those eight key IT projects within which it would be inappropriate to spend the special allocation of money.” Did you mean APPROPRIATE? Thanks Ray. You’re definitely not brain dead. That was a typo which I have fixed. It certainly reads better now. Thanks again.